It was a stunning day in October of last year. People from all over the City and beyond that knew John gathered around the freshly kindled fire pit that had laid cool for over a year. Dogs were pulling against their leashes, music flowed around the coils of smoke as friends recounted the reasons they came this day to walk the five-mile path to honor master craftsman, John Gutierrez. The shadow cast by this giant, in stature and deed, is huge and sets the bar for all of us who remain, to commit to leaving a legacy that is worthy of a life lived well. Few among us have the talent or vision to manifest the greatness left by John, but we all have the capacity to add our energy to the wake he set in motion to leave the world more beautiful than we found it, to ensure that the cities of America return to the root of industry – “real work”, and to build thriving communities that are capable of connecting across all lines of difference, be they social, economic or cultural. Where the cast-iron ring sat cold at the heart of the Clipper Mill community that John helped to conceive and build, now towers a fitting monument that burns strong every weekend to ignite the passion in our own hearts to keep the flame of these values burning, not only to honor John, but signal us all to be our best. The success of last year’s walk inspired John’s life partner, Roya Golpira, who know carries on the leadership of Gutierrez Studios, and other committed volunteers including John’s Sister Diana Gutierrez, and Charlie and Ruth Cronheim, to continue the Memorial Walk in support other initiatives that will make real the values that John lived. We at The Bench That Gives Apprenticeship are humbled to have been selected as the first Legacy Project to be the recipients of this year’s Gutierrez Memorial Fund the hosting organization of the John K. Gutierrez Memorial Walk. This is not just a token effort. The volunteers who have been working for the last 5 years to launch The Bench That Gives Apprenticeship in partnership with Gutierrez Studios, have had an extraordinarily difficult time raising the necessary funds to start the program. If we all support this effort that so many have called innovative and a vital model to seed industry in urban communities in the worst of times, we will raise the resources required to begin the training program before the end of the year. We urge your support for this effort. If you have ever said “I need to do more”, this is a powerful way to Walk the Talk of being about positive community transformation, while giving not only hope to individuals who have the passion and talent, but lack the means to become true artisans, but also to stimulate the transformation of Oldtown, a community in East Baltimore that is actively struggling to pull itself out of the ashes of a multi-generational economic crisis. True change is not about how much one does, it is about doing something with the commitment we all feel in our hearts to make our communities beautiful and thriving places for all to live. 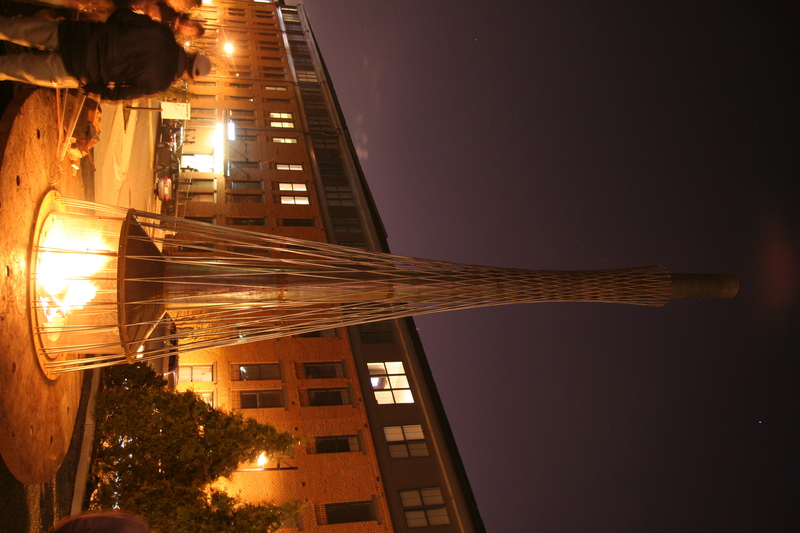 On March 19, the Baltimore community stepped out to ignite a new flame, and commitment to support the spanning of our community through a bridge for which Master Craftsman, John Gutierrez laid the foundation. “Skills Solve Ills”, John would echo with bellowing, baritone insistence. The depth of this simple message is revealed more powerfully with each passing day. To bring about any kind of change requires imagination. But what we can imagine is born out of what we see, encounter, and hold in our hands. What do we offer as images to the generations growing up in poverty in our urban environments such as Oldtown where this project will finds its home? There are few examples of locally-owned enterprise, there are few individuals earning a viable living, and most of all, there are few models for turning raw material into exquisite artifacts that serve the community. John’s powerful message resounds through his words. We must offer individuals access to developing skills worth living for, and the tools to manifest those skills into self-sustaining, family-strenghtening, and community-supporting enterprises. When we can create something out of nothing – something tangible, something useful, something beautiful – worthy of our pride – we learn that it is not something external that shapes our lives, it is the internal image we hold in our hearts of who we are and what we are capable of that yields our capacity to live enriched lives that build community. This was John’s Legacy, and the enduring gift of Gutierrez Studios. It is a flame that calls individuals from every walk of life to understand not only what John was capable of, but what we are all called to be if we are blessed to have examples that teach us, if we have the passion, the persistence and the will to shape our lives, as the bench that symbolizes this project was shaped. The Gutierrez Memorial Fund, created in memory of this Master Craftsman, has just selected the Ingoma Foundation’s project, the Ingoma/Gutierrez Craftsman Apprenticeship, to be the recipient of its funding and support to launch the first class of artisans from East Baltimore, to learn this trade, and this lesson. What will result is not a job for a handful of individuals, but the confidence that one can create a life, a livelihood, and a sense of one’s own capacity that can never be taken away. We thank Roya Golpira, John’s life and business partner, and now the steward of John’s legacy, for her continued commitment to this project. We also thank the Gutierrez Memorial Fund for seeing the depth of the vision of this project, and supporting its successful launch this year. We invite you to add your resources, your passion and your gifts to help ignite this dream. We are delighted to announce the release of Spinning Gold, our first mini documentary on the Nurture Form Community Bench project. We are already working on our next documentary which we will be releasing this spring. Spinning Gold provides a sense of what this project is all about. 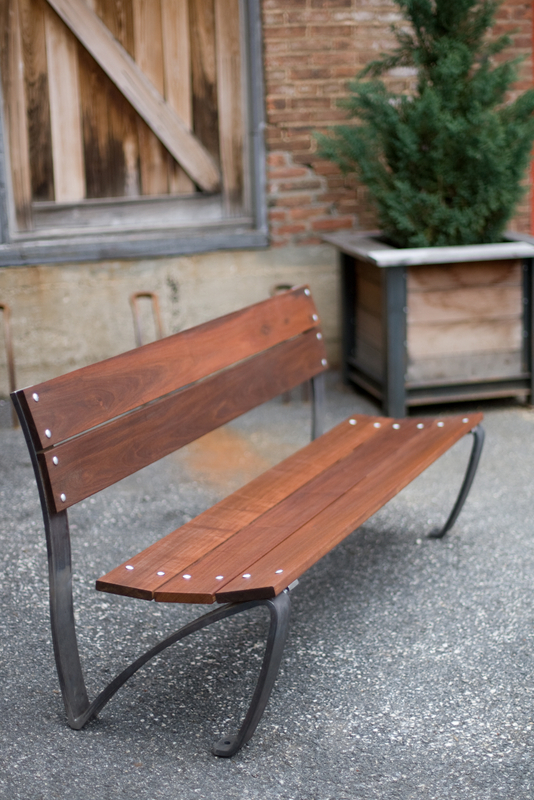 It also shows the metal fabrication process through the making of our prototype bench. This is the same process we use to build all of our Nurture Form Community Benches. 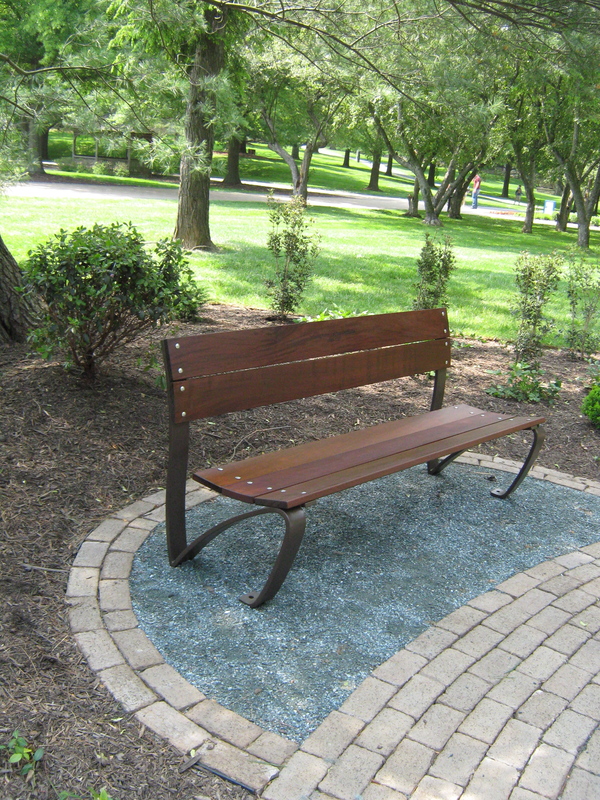 Please copy the link to our e Motion page and send it to individuals who may be interested in purchasing a Nurture Form bench for institutional, municipal, business, architectural, or personal indoor or outdoor applications. These funds will enable us to begin the John K. Gutierrez Craftsman Apprenticeship. Our hope is to raise the funding necessary to start this powerful program this spring. The more people who see this documentary, the more are likely to support this work. Please support this effort by being our ambassador! Now, get a cup of coffee, settle down, and give the next 15 minutes to changing the world! Goucher College takes delivery of the first Nurture Form Community Benches off of the workbench. They were installed yesterday around the newly constructed and landscaped labyrinth on the campus adjacent to the chapel. Two of the benches bare dedications to two freshman students, Jamie Deutsch and Dana Flax, who lost their lives while attending Goucher. This connection was facilitated by a student at Goucher who attended the Fusion Partnerships open house in December. 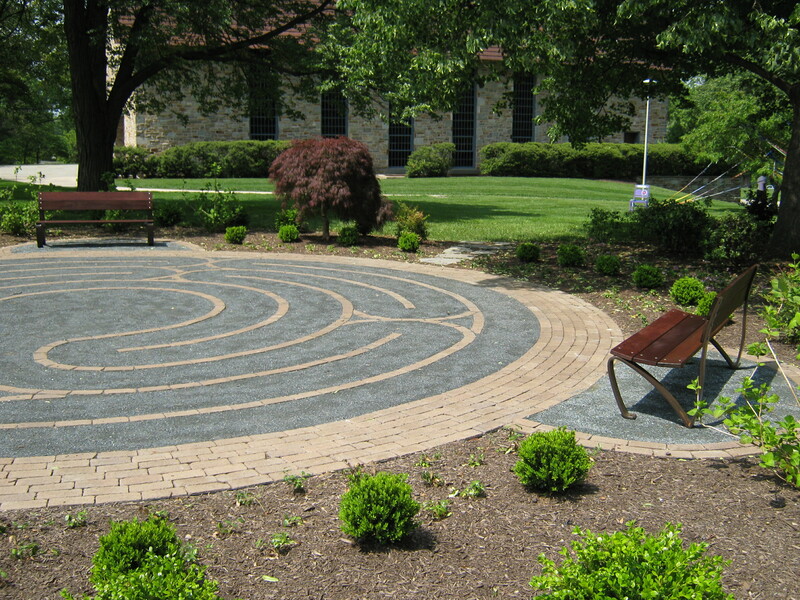 She inquired as to the background of the project, and took the information on the benches back to those responsible for completing the construction of the labyrinth. Linda Barone, an architect and Project Manager for Facilities Management Services at the college came to see the prototype bench at Gutierrez Studios the day it was completed, and ordered three of the benches to adorn the labyrinth. The Goucher Benches were custom powdercoated to contrast the crushed bluestone and brick that make up the curving forms of the labyrinth. There will be a dedication ceremony later this month to commemorate the students whose names are etched into the wood on two of the benches. We are honored that this meditative and reverent place will be the first site of the Community Bench. The Nurture Form Community Bench will be unveiled for the first time to the public at the D:center’s Design Conversations #19 Wednesday May 5th at 6:30 at The Windup Space, 12 West North Avenue in Baltimore. The long-anticipated Bench That Gives is the signature product of the emerging Community Wealth Generation Initiative. It is fitting that Architect Fred Scharmen, Curator of the Streets/Art Part 1 conversation, reached out and asked me to share what’s under the bench at this particular session. The Community Bench is all about merging “The Streets” and Art to create a new impulse and an avenue for folk in our urban neighborhoods to apply their genius, skills and hands at legitimate enterprise, while at the same time bringing the message of true community to our communities. The Challenge of this time is to offer compelling and real alternatives to the call of the streets. Where does design come from? We replicate the imprints we take into our souls. After the bench received her first “pedicure” in Bengal Red, I realized just how calligraphic her lines are. They remind me of the stylized lines of graffiti characters that have always excited me, and that have served as a vehicle for expression for urban artists for decades. As we search for evolving the Nurture Form design sense, these lines will certainly be a source for continued inspiration. I was walking through a grocery store the other day and saw a gentleman clad in a gray tee, with the orange “Ibis” logo across his chest. In that second, I realized another source of the Community Bench design. Ibis is a bike manufacturer, known for painstakingly engineered, light weight frames. I spent a couple months in Telluride, Colorado while my son was a day camp there. As a mountain bike rider I could not resist exploring the luscious and technical trails that encircled this little town in the mountains. I convinced a local bike shop to rent me an Ibis Bow-Ti to navigate the unforgiving trails of those mountains for the time I was there. Most dual suspension bikes rely on a complex system of joints, couplings, and springs to activate the “rear triangle” providing travel to the back wheel to eat the bumps and save the rider. The Bow Ti actually uses the natural flexing properties of it’s titanium frame material to eliminate the need for joints. There is no question that my brief but deep love affair with this incredible frame provided the inspirational imprint that led to the use of only the frame material of the bench to provide the suspension for the seat and back. To hear more about the what is behind the physical and social engineering of the Nurture Form Community Bench, come to the Design Conversation at the Windup Space. 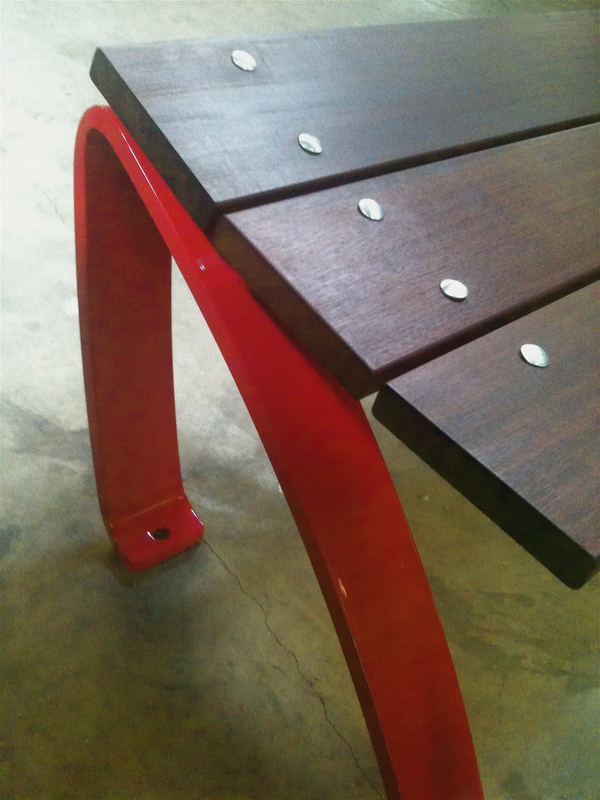 We will have the Bench at the Windup Space for you to see, touch and try out. We hope to see you at the launch. Our urban communities are suffering. Even more now that the bottom of our economy has dropped out. And for those who were at the bottom, the hole has gotten so deep, there is too little light at the end of the tunnel to see the way clear to even subsistence, no less prosperity. Simply replying to the problem of poverty with some form of the adage, “Pull yourself up by your bootstraps” has become such an absurd notion, that we as a country are called to look at the challenge from a wholly different perspective. As lawyer and economic visionary John Morris reminds us, “One person can’t do it alone.” But how do we as a community, as a nation, begin to approach this challenge as a unified whole? This is the challenge that drove the creation of the John K. Gutierrez Fabrication Apprenticeship. Embedded in John’s answer was not only an admirable gesture, it is the core of what it will take to solve the problems that are plaguing not only Baltimore, but every urban environment in our nation. Morris explains, “The easy old way is to ask how do I win ~ the new way is to ask how do WE win.” Why would a successful entrepreneur who made his mark by creating exclusive, stunning, difficult to create, and expensive objects, purchased by those with the personal and corporate resources to afford such things, offer to give away his “secret recipe” to individuals with scarce opportunity of replicating what he has created? This is a question that holds the key to moving us as a nation beyond the divisions that are severing the country. The answer is that this visionary builder understood that he is not an individual, and that communities are not simply collections of individuals responsible for taking care of their own. John lived the new way. He saw himself as an integral component of his community, and saw the other components, no matter which side of town they lived in, also as integral components of the community. If we are all not healthy and thriving, how could he view himself as healthy and thriving. “At the end of the day”, John said smiling,”the more people who are doing well in the community, the more people there will be out there who can afford my work.” This win~win perspective epitomizes enlightened self interest. John, as well as all the partners on this project, understand SELF to be a collective, rather than an individual notion. In addition, John understood that his secret was not a trick. He had the confidence and understanding of his craft to know that the secret is knowing that if you dedicate yourself to your work, your work becomes a fingerprint of you, therefore it is unique and not stealable ~ at least in a sustained way. 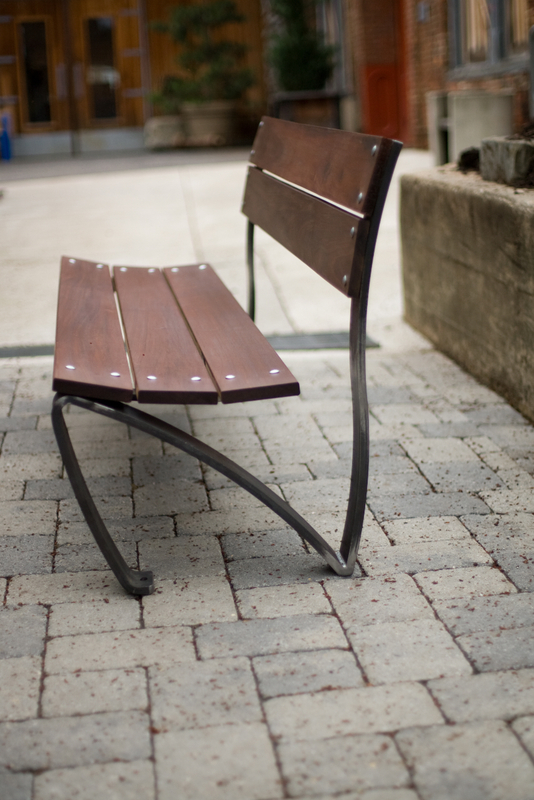 It is fitting that the first product to be born of this partnership with Gutierrez Studios is The Community Bench. John’s sense of community created this opportunity, it enabled this stunning design, and it created the community confidence that has provided the support necessary to launch this daring and inspired endeavor. Sadly yet powerfully, The Community Bench was formed on John’s last day on earth. It is in honor of John’s amazing spirit of community that we have named this project in his memory. Thank you John for putting your shoulder into this project and breathing life into this dream for a community, so long in the shadow of poverty, to at last prosper. Deepest thanks goes also to Roya Golpira, Johns loving partner in business and in life, who is carrying on the leadership at Gutierrez Studios, and the commitment to this project. The Bench That Gives Shows Off at Baltimore Fashion's Night Out. The Bench will make an appearance and provide a high style backdrop for the fashionistas attending Fashion’s Night Out. Nationally Recognized portrait and fashion photographer Tobechi Tobechukwu will do a fashion shoot with all interested attendees on the bench for 90 minutes during the event at the Intercontinental. Kevin Griffin Moreno, creator of the new and powerful blog, Unsung Baltimore Features The Bench That Gives' founder in its second article highlighting Baltimoreans "of all races, ages, faith traditions, and economic backgrounds who commit themselves to piecing together the fragments and making our community whole." Thanks for the push Keven! Head down to Howard and 26th Street in Baltimore and grab a great cup of coffee at Charmingtons, and have a set on the first neighborhood Community Bench. Take a pic and tell us about your experience on the Community Bench in our new section Bench Marks.